A study of lakes in Connecticut reveals that recreational angling pushes largemouth bass to evolve. (Inside Science) -- Fishing a lake may, over time, make the fish in that lake harder to catch. A new study suggests that recreational fishing, aka angling, causes evolutionary changes over the course of decades. Largemouth bass living in waters popular with anglers have been adapting to become less active. New generations of increasingly timid fish may eat less and be less likely to bite. "When your grandfather told you the fishing was better back in his day, it's possible he was right," says Jan-Michael Hessenauer, who reported the finding online June 3 in the journal PLOS ONE. Now a graduate student at the University of Connecticut in Storrs, Hessenauer caught his first fish as a child, using a wooden pole his dad made. He spent his youth fishing for fun at his uncle's cottage on a lake and in the cold streams of northern Michigan. In the fall of 2012, a year after coming east, Hessenauer went fishing for largemouth bass in Connecticut's Amos Lake and Gardner Lake -- for the sake of science, not sport. In the early part of the 20th century, people ate their catches, but recent decades have seen the rise of catch-and-release, and now most fish are thrown back. Curious about how this activity has affected the bloodlines of the fish in those two lakes, Hessenauer captured some baby bass using nets and electric stunners. For comparison, he also collected babies from two reservoirs owned by water companies that have long prohibited fishing. 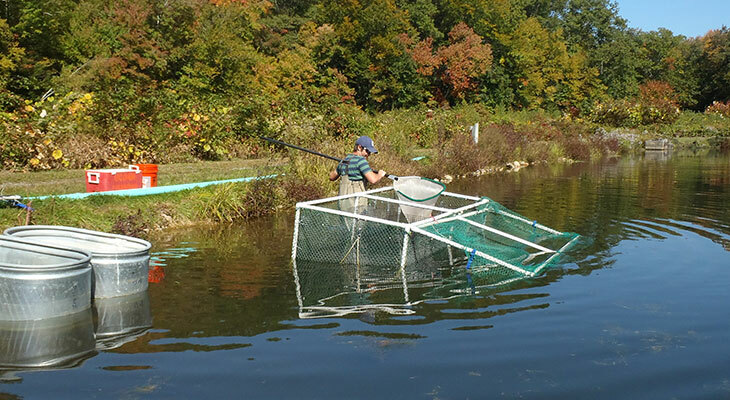 After raising fries from both sites in an isolated pond for 10 months, he and his team then measured how much oxygen the fish consumed when at rest. This provides a proxy for metabolic rate, which relates to how active a fish is. The lake-born bass had slower metabolisms. Animals tend to inherit their metabolisms from their parents, so this discrepancy between reservoir and lake fish could be an example of evolution in action. For a fish living in a placid reservoir undisturbed by anglers, having a high metabolism -- and thus a more aggressive demeanor -- would be a good thing. Bolder males are better at defending their nests from other males and critters intent on gobbling up their eggs or newly hatched young. Their protected offspring would be more likely to survive and grow into bold males that are themselves more likely to pass on their DNA to their offspring. But for a fish trying to get by in waters teeming with sportsmen, being aggressive could actually be a bad thing. A pugnacious fish would be more likely to strike an angler's hook and disappear -- leaving its progeny defenseless for a short time or forever, depending on whether the fish gets thrown back into the water and whether it survives the ordeal. Such fish would also be more likely to go after a wriggling worm on a hook in pursuit of food outside of the spawning season. In short, fishing pressure allows the meek to inherit the lake. "The fish adapt in the face of a new predator, humans, and evolve to become less aggressive," said David Philipp, an angler-turned-biologist who chairs the board of directors for the Fisheries Conservation Foundation in Champaign, Illinois. Philipp spent decades showing that fish can be bred to become more or less aggressive. In the 1980s he invited anglers to cast in ponds he had seeded with bass. When fish that were caught three or more times were mated, generation after generation, their family line gained a higher metabolism. Fish that were caught once or not at all gave rise to another lineage with a lower metabolism. The new study is the first to suggest this change in metabolism under natural conditions--though Hessenhauer can't be 100 percent sure that differences between the lakes and reservoirs other than fishing levels could be to blame. What the change means for the lifestyles of bass remains an open question. Creatures born with slower metabolisms tend to mature and give birth at a younger age. Like lions or eagles or crocodiles, bass are apex predators at the top of their environments, so changes in the diets of bass could also have a trickle-down effect on the other inhabitants of their ecosystem. Hessenhauer and his colleagues calculated that a 2-pound (0.9-kilogram) fish from one of their angled lakes would eat about 0.5 fewer Calories per day of the fishing season than reservoir-born fish. That means more of the bass's prey can survive. Which means less of the prey's prey can survive. And so on, and so forth. "Although this change in caloric consumption might seem small, once you multiply it by the number of individuals in the food web it has the potential to make some relatively substantial changes," said John Post, a biologist who studies trout at the University of Calgary in Alberta, Canada, and wasn't involved in the new study. Whether other kinds of large fish in other lakes in other places are evolving is unknown. Bass in New England may experience more pressure to adapt than their peers elsewhere. Species inhabiting lakes in the South, for instance, can have a longer breeding season that provides more chances to reproduce. They also tend to live in larger populations that dilute the impact of fishing on each fish. "We need more research to see how things differ by location," said Hessenhauer. But even though the impacts of evolution on lake fish remain far from definitive, he encourages managers of lakes to consider how much pressure is being put on their fish. The big catch-and-release tournaments popular with anglers may, in the long run, have repercussions on the tournaments themselves.